I spent a lovely evening recently at Renaissance KL Hotel’s Dynasty Chinese Restaurant. 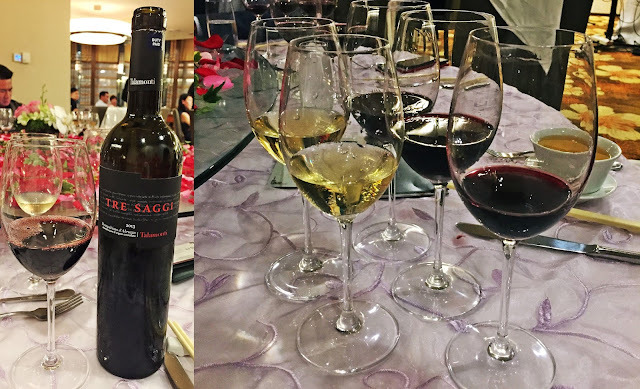 The cosy, intimate dinner for about 30 people was hosted by Italian winemaker Rodrigo Redmont of Talamonti. His family-owned vineyards in Abruzzo, a two-hour drive east of Rome, produce not only wines but a limited edition olive oil; only 1,000 50cl-bottles are produced annually. After all, the Abruzzo region is famous for olive trees which, Rodrigo says, are protected in Italy and cannot be cut down at will. We watch a slide presentation on Talamonti wines while nibbling on canapés and sipping Trebi Trebbiano d’Abruzzo DOC. This is an easy drinking white, made with Trebbiano d’Abruzzo grapes. There is a hint of sweetness amidst the crisp finish and a distinct aroma of apples and peaches. The dinner proper starts with a soup, Winter Melon stuffed with lobster, crabmeat with environmentally-correct faux “shark’s fin” in thickened chicken essence broth. I can taste crustacean sweetness in every spoonful, making this a delightful start to the meal. With the soup, Rodrigo offers Trabocchetto Pecorino Colline Pescaresi IGP, made from the low-yield pecorino grapes. With hues of pale straw, it bursts with a bouquet of ripe pear, green apple and peach. A refreshing acidity and dry on the palate. Dynasty’s award-winning Chef Kok Chee Kin then presents a triple entrée platter of Wok Seared Cumin-Rubbed Lamb Rump, Honey-Baked Atlantic Cod Fillet and Chilled Mini Abalone. I work my way from the cod and abalone to the lamb. The thick chunk of cod is sweet and juicy, baked with timed perfection that speaks volumes of Kok’s culinary passion. The chilled abalone serves to freshen up the palate slightly, prepping it for the lamb. And what a stunning serve of lamb it is. The hint of cumin plays well the balancing act with the stronger flavour of the oh-so-tender meat, cut into bite-sized cubes. With this, a pouring of Moda Montepulciano d’Abruzzo DOC, a ruby-red wine with violet undertones. I can taste ripe but lively red fruit, enveloped in oak spices. Indeed, the notes of cherries, plums and fresh raspberry are pretty persistent on the finish. A snowball of Salted Plum Sorbet after this helps clear the palate for the main course of Slow-Seared Wagyu with stirfried portobello mushroom, spinach tofu and black pepper jus. But because I don’t consume beef, Chef Kok prepares for me a meaty Rack Of Lamb that is perfectly pink in the centre and juicy. The red meat calls for Tre Saggi Montepulciano d’Abruzzo DOC and diners are offered Kudos Colline Pescaresi Rosso IGT as well. It is good to be able to make an instant comparison between the two. The name “Tre Saggi” translates as The Three Sages. This deep, complex wine is a vivid red with purple undertones. At first sip, I am a bit undecided. As it turns out, the taste quickly develops as I work my way through the lamb. This is a wine that will be best decantered for a few hours to release the aromas of red fruit, vanilla, chocolate, liquorice and cloves. A complex and inviting nose to go with the fruity, elegant finish. I far prefer this to the Kudos Colline Pescaresi Rosso IGT though critics have scored this as one of the top 5 Colline Pescaresi IGT wines. Perhaps I am awed by its strong spirit that comes from the blend of Merlot and Montepulciano. Dessert is Raspberry Lychee Mousse wrapped in rose jelly and served with mango-coconut ice cream, stewed pear on chocolate soil and crisp almond biscuit.